An Italian-Albanian drug gang is destroyed by anti-drugs Police in Trentino, Italy, and at least 18 people are arrested during the "Shaman" operation. The investigations began in October 2017, where investigators began monitoring Anny's bar at Castello di Fiemme managed by Paolo Girardi, considered as a place where cocaine was possible at any time. The initiation of the investigators' activities began with the information of the existence of a group circulating around the bar where was possible to sell cocaine, which was shared by Italians Paolo Girardi and Alessio Sartori and the Albanian Taulant Shtembari. The drug sold by the group is distinguished byhigh degree of purity despite being mixed with other substances such as caffeine, mannitol and aspirin. One of the most important and functional figures of the group was the young boy Vincenzo Marti, who dealt with the management and delivery of drugs by mail or even by buying it directly from suppliers. Other citizens were devoted to the distribution of narcotics in adult environments. One of the most important Albanians in the bunch was Taulant Shtembari, while the Moroccan named Hamza Ridha carried out the duty of the mediator by putting in contact Shtembari and Girardi. 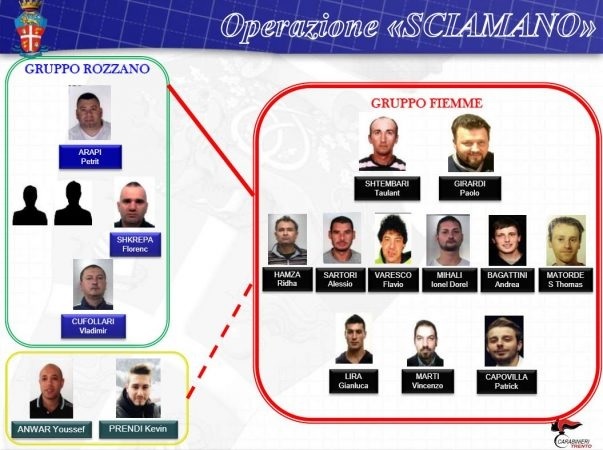 The group was directly linked to a team of "high level" drug traffickers based in Milan and led by the Albanian Petrit Arapi, a drug dealer with a residence history in Val di Fiemme that allowed him in difficult times to established relationship with Shtembari. All investigations made it possible to detect the identify of at least 100 clients.